Calling all hockey fans! If you're looking for app that contains a wealth of information concerning all things relating to this great winter sport then look no further than The Liam Maguire Ultimate Hockey Experience by AGS Advanced Software, Inc. Liam Maguire is Canada's foremost hockey trivia expert and this free application combines news, trivia, chat, video and Wayne Gretzky Authentic Sponsored memorabilia prizes to help you stay on top of all the action as it happens. If you answer correctly the trivia question of the day (for only $.99 per try) you'll get 2 entries into the monthly signed memorabilia draw. 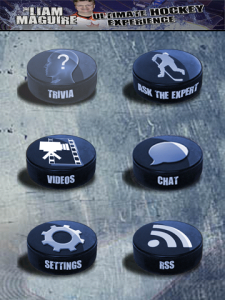 Hockey fans will be able to speak directly to Liam Maguire using the Ask The Expert and built-in chat system. I must warn you there is a fee (determined by which response time is selected) for asking Liam any NHL related question. Good news is the chat system is absolutely free and is cross platform so you can speak with other hockey fans around the globe whether they're using a BlackBerry, iPhone, or Android device including Liam himself. Once a week he'll provide his insights on past games and future matchups and anything hockey related. Again, while there are charges to join the daily trivia challenge and ask the expert it's perfect for staying on top of all hockey related news items with their free RSS feed, chat room, and Liam's weekly video wrap ups and interviews. You can check it out in BlackBerry App World and it's compatible with most BlackBerry devices running OS5 and higher.